Pantone is punking us, right? 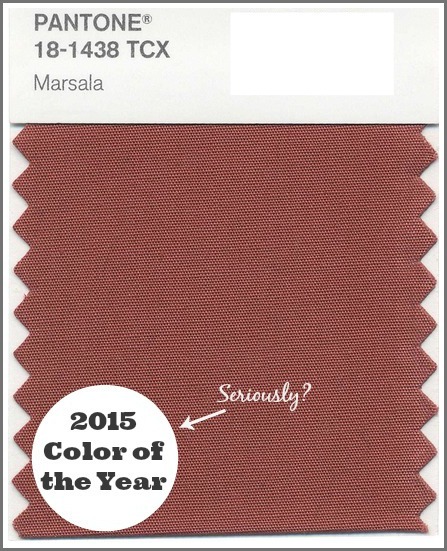 Do they really expect us to start wearing and decorating with the brownish-red color Marsala in 2015? I thought 2014’s Radiant Orchid was an odd choice and was kind of relieved that it never really caught on. But at least the orchid was something that made sense with the pastel and gray trend. I haven’t seen this dusty burgundy color since, oh, the ’90s? The longer I looked at the photos they used to demonstrate the color, the more nostalgic I started to feel. It takes me back to the first house I owned and the furniture I filled it with. Gotta point out that my husband never wore a burgundy apron, though. Ha. Personally, my favorite thing in that photo is the blue dress. I’m wondering how the reddish brown is going to go with all the gray everyone has painted their houses with. In these photos they’ve paired it with warmer tan and beige tones. 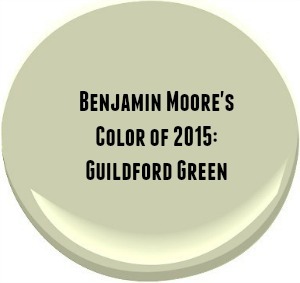 Benjamin Moore declared a lighter shade the Color of the Year: Guildford Green. 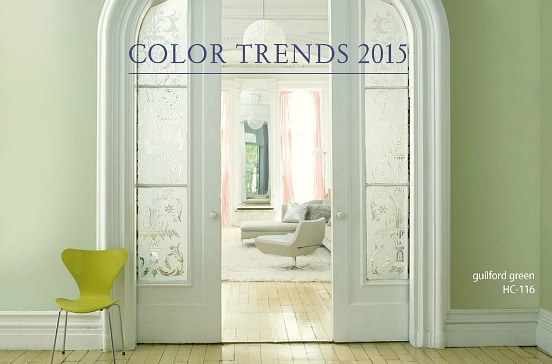 What do you think of the color predictions for 2015? Are you surprised or did you see them coming? I thought a shade of navy or indigo might make the list, but, BZZZ!, I guessed wrong. Are you willing to try any of these at home? What colors have you been loving lately? Erin Gates of Elements of Style also posted a similar discussion on her blog and posted a funny picture of the look this color reminded her of. I LOVE the blues she picked! I do, too. Very pretty! IMO, Benjamin Moore is the only company that got it right. The other shades are fine for small accessories, but can you imagine an entire room of….say….Coral Reef? I swear, my husband would move out if I painted anything but the girls’ rooms in this shade! As for Marsala being “a natural fit for the kitchen and dining room”, I find this quite ironic. I recently painted my kitchen and dining room, which were a remarkably close match to Pantone’s choice for 2015. A friend of mine asked me, after seeing my place decorated for Christmas, if I regretted painting over the red. I replied “Not a bit! Feels twice as big!”, which actually is the case. I think Pantone is off-base with this one. I can see these predictions as good advertising or the way to introduce a color into discussion, but the whole trend thing is for those who are scared to make decisions on their own. Nothing is more refreshing than walking into a home where color choice was made on personal taste and appropriate setting. Dare to be different! AMEN!!!!!!!!!! March to the beat of your own drum! Not a fan. That’s not quite burgundy, not quite brown, not quite rust. It’s just depressing. I can’t imagine decorating anything with it. You’re right, it’s not even as deep and rich as the burgundy we used in the ’90s, is it? Color me baffled. I guess I’m the odd man out! I don’t like the Coral Reef at all….everyone who does, can have my share….gladly! The Green is fine with me – I happen to LOVE greens…as long as they aren’t too BRIGHT! The Marsala I LOVE too! And it doesn’t remind me of the 90’s and believe me, I was alive and present in the 90’s. I say…to each his own. Take what you like of colors and leave to rest to others. If we all liked the same things…there would be no choices. “Marsala”? I think they meant “Mud” or “Raw Liver.” Seriously though, any color is good in the right place and right dose. Marsala would be great for small accents in a room with lots of rich color. I guess everyone has their favorite colors, and colors that send them screaming from the room. I wouldn’t even cook with a wine that color, let alone decorate with it or where it. “Raw Liver” hits the nail on the head. I am not a huge fan of any of this year’s colors…I was looking forward to blue too. I guess we will have to make our own color of the year! Marsala – ugh. It looks puce to me. I read some really nasty descriptions of this color – don’t think many like it. Reminds me of the mauve craze of the early 80’s, which I liked at the time. Yes, I’m that old. But it was so overdone, most of us who lived with it then can’t stand it now. Will the next color to come back be a variant of Williamsburg blue, which was hot about the same time as mauve was? If you live long enough, you can see the trends cycle through. I prefer the Guildford Green. I looked at it on my BM fan deck because colors are always different on computer screens. It was a tad yellower than I prefer, a celery color. Still, much better than Marsala. Coral Reef looks like it belongs in Florida, so keep it there, in my opinion. Might be cute in a little girl or teenager’s room, though. I thought it was interesting recently when I was looking at a popular (and once favorite) clothing chain, that I didn’t like any of the colors. The only color I saw was red – for Christmas, I suppose, and I’m not a red person – and this Marsala. The rest were all neutrals of black, gray, and flax. I didn’t see anything I liked and walked out disappointed. Give me some color, please. Blue would be nice. Saw more last year with the indigo trend, but not as much now. Carolyn, I’m already seeing some “Williamsburg blue” (dusty blue, I called it in the 80s) on Pinterest, particularly in painted furniture. That was my first thought, “time for that color to come back.” With so many shades of blue popular right now (aqua, powder, navy) it’s only a matter of time. This “marsala” to me looks very similar to the rusty red (barn red) that was popular at the same time. “Been there, done that” (though I do still have quite a bit of deep burgandy). Marsala definitely reminds me of the mauve and dusty rose shades that were so popular in the 80’s. It already looks outdated to my eyes. I think I’ll pass. Ahhhhh marketers they try so hard to get us on their bandwagons. Who at these places decides? Do they sit there and say, “Hey we need to declare a yearly color?” And do they just do a random spin of a wheel, ha ha, or do they follow some intense algorithms of sorts? I am with you in regards to that blue dress in the photo. The style and color is stunning. I would love to see the walls of a library or powder room or even a rich looking, yet tastefully done dining room done up in that color. DREARY written in all caps because it is really dreary. Another vote for no way on the marsala. That color would never speak to me in a room, or a store, not even in a single accessory. But I loves me some green. I like both the olive (I may be the only one!) and the BM color, but I like the olive better. It’s a good living green, unlike the old, dead color we had last time around. The coral is fine, but only on accessories, and only in summer! I’m so glad I never jumped on that mauve or dusty rose and blue 80’s bandwagon. Hey, I’m old enough to have had Harvest Gold appliances in my first appt. and Avacado Green in our first house. I grew up in Florida in the 60’s with pink appliances! Oh boy! Well, I’m a muted-color/antiques/old house person, always have been, and the Marsala looks fine to me. I picture it in an English drawing room with some old comfy couches upholstered in a tapestry fabric, lots of books, a fireplace, oriental rugs, etc. I like the green paint colors too, but the Coral Reef – yeccch! It all depends on your personal preference, not what’s “on trend”. I’m in total agreement with you Laura. I think color selection has a lot to do with your locale. Bright colors and lots of white looks fine in homes in the south but here in the north we need cozy and grayed down colors to match our clime. I tend the opposite direction (in Wisconsin). It can be so dreary here (think March through May-winter wants to be done but it’s absolutely not spring) that I need bright, clean colors. My husband and I actually just painted our master bedroom coral-he picked it! We both love it; it’s very fresh and peppy and has us both starting the day positively. The Marsala colour is too blah for me, not even for accessories. I spent a lovely hour on the weekend going through the piles of inspiration clippings I’d pulled out from magazines. A recurrent theme is blue, white, and maybe a touch of green. Set against a background of neutrals. So for me, I’m happy to read about the colour of the year but my home will be what makes me feel at home. And Marsala definitely ain’t it. I’m diggin’ the use of the Olive Green in the photo. It looks like a comfortable color to live with. The Coral Reef on the other hand is treading into that 80s “seafoam green and peach” trend that always reminds me of Miami Vice–Yikes! Personally, as a red head, I love it. I know you and others have tried and failed to explain to me how it is that Pantone got elected Queen of Shade and thus gets to decide how we should color our lives, but I think this year might be the year in which I can finally quit trying to figure it out and just assume that, like high fashion and the Westminster dog show, those people may be way fancier and special than me, but I’ll make my own clothes, dog, and color choices myself. 2015 is clearly going to be liberating for me. I am with you – love the blue dress! Wish that blue was the color of the year! Marsala is a dead ringer for my old server apron from Cracker Barrel. Maybe that’s the kind of apron the model in the photo is wearing, then. Ha. Um, no. I’m another who won’t be using ‘marsala’, but then I suspect I am not in the target demographic. I do like ‘barn red’, but on barns thank you. 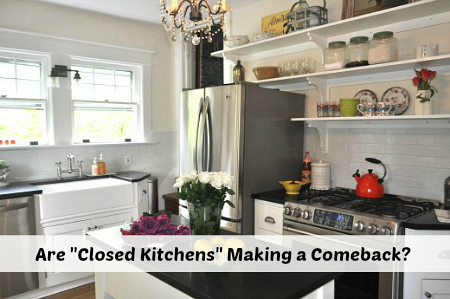 Have you heard what Donald Kaufman is doing with color this year? What were they thinking? Such a muddy, dreary color. I saw one review that likened it to refried beans. Imagine that on your walls. No thank you.BM’s Guilford Green is much nicer but I was routing for indigo. Marsala is not a ‘real’ color, is it? That’s exactly what your kids get when they smoosh all their tempera colors together after finger painting. You always do great posts, I like opinions! I haven’t made up my mind about the marsala color, but it feels like this color is front and center of colors Pottery Barn has been doing for 30 years. Check out bedding, rugs, pillows. Maybe it has a little more rust? Anyhow, I like how Pantone showed the blue with it, it made it interesting. John Robshaw has been doing blue with a “marasala” in fabrics in a beautiful way too… and for a long time. Like the Tak Walnut pattern. Which has blue. Blue with marsala, maybe that’s the trend?=) Cheers! I think that by pointing me to the Pottery barn catalogue. . .in a quick glance, you taught me something unique. A day it two before Pantene announced, I was watching “Major Crimes” on TV and noticed Sharon’s home was anchored in this color. I wondered if in 5 years it would look “right”. So many old TV shows have interiors that were before their time but look on trend right now. I think we’ll adapt our tastes as the marketers move us in that direction. Yes, I know I’m a sheeple. All this talk of color of the year reminds me of when stylish hemlines were decreed from on high. I wear what I like and I use colors I like. I really don’t care if they are current or not – just how the rooms make me feel. It’s not just about the colors selected — every room has different light which really determines how the color will work in a real environment and not a photo shoot. And I LOVED that video clip you included about the avocado bath fixtures! I hope that the textile mills realize the Marsala is good only in small doses. I’d much prefer a darker and richer wine color that glistens versus the faded maroon that Pantone picked. Even a darker and richer wine color is better in small doses. I think the Guilford green and olive green are more viable neutral colors. However, I prefer my greens to a have a bit more blue than yellow and less grey than olive or Guilford green. The Coral is another color that is good in small doses. The only place that I have Coral and Marsala in my world is in my rose garden. I think you’re onto something, Lynne! Ha. I am not a fan of mauve, but I sure do like this color more than the colors chosen in the most recent two years. This one is earthier, which I like. And I could enjoy working with this. You must have been reading my mind! Ha! Seriously, I think the blue in that dress could have been the color of the year. I’m finding myself drawn to navy blues, lately. i’ve decided that since pantone evidently has a bunch of monkeys randomly hitting a box of crayolas connected to computer keys to pick out the color of the year, we are all just better off deciding what colors we love & can live with and declaring them our personal color of the year :)! Not a fan of the Marsala at all. Personal preference has me choosing lots of white and blue, with plenty of green thrown in. I was hoping Pantone would choose a shade of blue this year. I liked the green BM chose, but the coral reef by SW is just a tad too in your face for me except in very small doses (and I mean really small doses — I thought the table in the photo was too much. Ha!). I am fine with the Marsala. I have seen a few variations of it that I really like. I never changed to the ever so popular grays that are so popular since I prefer browns and ivories. I am seriously considering painting my front door a Terra Cotta color (the exterior is Khaki), so maybe I will look at Marsala. Just the day before Pantone announced their Color of the Year, I read on 4 different sources about 3 differenr colors that were in the running for Color of the Year…not a single one mentioned Marsala or (faded burgundy brown). I was astonished when the following day I read with a drum roll that MARSALA was Pantone’s choice! That murky faded maroon looking color they were trying to sell as a rich earthy tone perfect for fashion and decorating was “IT”!?! YUCK, what do they think we are dummies that don’t know the difference between pretty and impossible? I’ve been quite suspicious of Pantone ever since the Tangerine Tango started a different train for them. With the addiotion of <arsala, the train has officially fallen off of the tracks! I like the Olive Green, I actually painted my kitchen a very similar shade 2 years ago with Cream cabinets. It really does act like a neutral. My husband of all people was reading something and said ” Marsala is the new hot color?” We were both like yeah, not a good choice. It may as well be “dusty rose” I love the blues, grays and still love our asparagus green foyer.